Frank Strack's Blog – Page 35 – A Cursory Look at The Life of a Dutchman and Those Who Have to Deal With It. Chamonix, France is perhaps the world’s most well-known ski area. Unlike most ski villages in the United States, Chamonix encompasses an entire valley at the base of Mont Blanc and there are various ski areas that belong to Chamonix, including three family ski areas (La Flegere, Le Tour, Brevent), and two advanced areas (Grands Montets, and the Vallee Blanche). Perhaps the most outstanding way in which Chamonix differs from the ski areas in the US is that it is generally acceptable to ski out of bounds, or off-piste. Although some avalanche control is done, it is generally less comprehensive than in the States, and avalanche risk should be considered while skiing. Some of the advanced ski areas can be very dangerous and typically require that you hire a guide. We had huge amounts of snowfall nearly every day, and visibility was so low that we skied two full days at Le Tour because we felt confident we wouldn’t unwittingly wander off into a dangerous area. The first day we were there was perhaps the lowest visibility we had during the trip, and we all suffered from vertigo because we couldn’t tell the snow from the sky. But, the obvious upside of that was the bottomless powder we skied on all but one day, and even that day, we skied great soft snow. On our last day of skiing, we skied the Vallee Blanche which is a 20 km long run which takes you down and around Mont Blanc, through various glaciers and over incredible terrain. We hired a guide to help us navigate the area effectively, not only in getting down the right path, but also in helping us avoid crevasse. Overall, the skiing in Chamonix was absolutely incredible, and the level of difficulty was variable, although even the areas considered to be easier was relatively challenging. The family areas contained plenty of very difficult terrain, although technically only rated as “red”. (Black is the most difficult, Red is intermediate, Blue is moderate, and Green is easy.) We skied a black run at the Grands Montets, which contained pitches with slopes at what we estimated were close to 60 degrees. Allegedly, the off-piste skiing at the Grands Montets is the best and most difficult in the area, although we did not do any of that there. Next time! We put together a video of the ski trip. You can find a downloadable QuickTime version on the Video page, in two versions: short and long. Note: The quality of this version is lower than the Quicktime version available here. For best results, watch the Quicktime verison. Some of the music in this video contains explicit lyrics which may not be suitable for children or work. 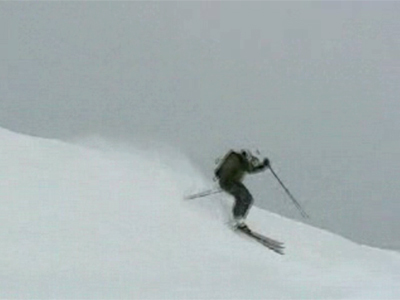 A video of our ski trip to Taos in February, 2004.